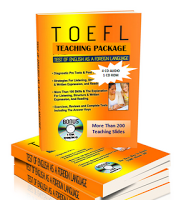 Sometimes in the Written Expression section of the TOEFL test, adjectives are incorrectly used in place of adverbs, or adverbs are incorrectly used in place of adjectives. Adjectives and adverbs have very different uses in sentences. Adjectives have only one job: they describe nouns or pronouns. In the first example, the adjective delicious describes the noun meal. In the second example, the adjective delicious describes the pronoun it. Adverbs have three different uses. They can describe verbs, adjectives, or other adverbs. In the first example, the adverb quickly describes the verb writes. In the second example, the adverb quickly describes the adjective written (which describes the noun letter). n the third example, the adverb extremely describes the adverb quickly, which describes the adjective written (which describes the noun letter). The following are examples of incorrect sentences as they might appear on the TOEFL test. 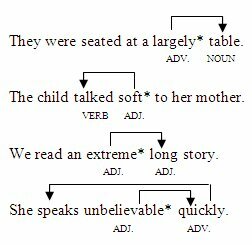 In the first example, the adverb largely is incorrect because the adjective large is needed to describe the noun table. In the second example, the adjective soft is incorrect because the adverb softly is needed to describe the verb talked. In the third example, the adjective extreme is incorrect because the adverb extremely is needed to describe the adjective long. In the last example, the adjective unbelievable is incorrect because the adverb unbelievably is needed to describe the adverb quickly. The following chart outlines the important information that you should remember about the use of adjectives and adverbs. Adjective poor is incorrect. It should be poorly (adverb) because it describes planned (adjective). adjective incredible is correct because it describes story (noun). 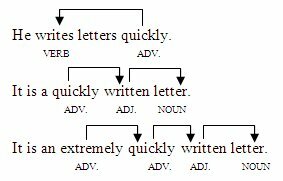 adverb quickly is correct because it describes written (adjective). adjective written is correct because it describes note (noun). Adjective loud is incorrect. It should be loudly (adverb) because it describes spoke (verb).